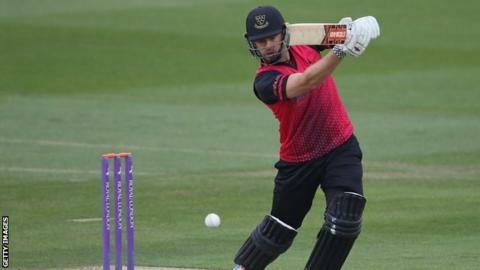 Sussex further improved their hopes of One-Day Cup qualification by beating Surrey for a third straight group win. Chris Nash (82) and Harry Finch (61) led the way at Hove, sharing an 85-run second-wicket stand as, having been put in by Surrey, Sussex piled up 300-8. Mark Stoneman batted well for 60 in Surrey's reply, and Ollie Pope offered late defiance with 55 off 63 balls. But the visitors were never really in touch, being bowled out for 205 in the 42nd over to lose by 95 runs. Surrey's third defeat in five games leaves them with an uphill battle to qualify going into their next game on Friday at home to Kent. Sussex are back in action on Wednesday, with a trip to Chelmsford to face Essex. Neither Sussex nor Surrey have secured consecutive wins against each other in this fixture since Surrey won in 2007 and 2008. "Qualifying for the quarter-finals is what it is all about. Hopefully, one or two more victories in our last three group games will clinch that. "We've turned around our fortunes in this competition. That's largely because all the senior players in the team sat down and decided we had to take more responsibility. "This was an excellent team display. All facets of our game clicked and we batted, bowled and fielded well. A total of 300 was always going to be a challenging target." "At the halfway point we were actually quite happy with their score, which we felt was 20 runs or so light of what it should have been on a very good pitch. "But we just didn't bat well. Our highest partnership was 44, which is just not good enough when you are chasing a decent total. "Our batsmen have been in good touch but no one really went deep into the innings after getting starts. Ollie Pope played very well, though, at the end. It is great to see a younger guy come in and take his opportunity."